I couldn't help myself, instead of concentrating on knocking over the AB naps and playing with the nellyphants and dixon 15's I let myself be seduced be the minden syw french. So here's a quick look so far and then I'll put it away and get back to the other stuff. At least I was able to keep it down to one figure, the rest are still waiting nervously in their packs.... 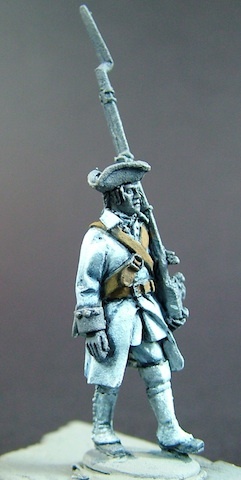 I'm thinking about using a white undercoat and a shaded toy soldier style paint job if I can work out how to do it, off to but some humbrol and testors enamels, plastic paint (acrylic) wont cut it for that style of painting I think.